The Slovak Investment and Trade Development Agency invites you to the Slovak Matchmaking Fair Nitra 2018, which will take place on May 23, 2018 in Pavilion K, Agrokomplex Nitra, Slovakia as an official accompanying event to the 25th International Engineering Trade Fair in Nitra, Slovakia. We would like to invite you to the next Business Breakfast on the topic:"Amendment in the Labor Code from May1, 2018"
events took place on April 19. The second series of regional seminars organized by ISA members will take place in October / November. China Brand Show 2017, Warsaw, China-expo.pl. Expected law and tax chnged in 2017. Informal meeting of ISA members. SpeedCHAIN first time in Slovakia. International engineering, architecture and project management company PM Group celebrates 5th anniversary on the Slovak market. 9.6.2015 - Košice, Nitra, Žilina. Informal meeting of ISA members with rum tasting at The Rum Club. Visit of the Lebanese delegation. Visit of Ukraine delegation from Invest Ukraine agency. Site Visit of new shopping mall. Business Seminars in regions on a topic – How to improve daily operations of your business? Practical guides for managers. Networking meeting organized by N-Parner Group company with Japanese Embassy in Slovakia. First ISA's members meeting in year 2014 with Wine Tasting at Hotel Matysak. Last of the events of HR roadshow roadshow with the topic focused on vocational education: „Flexible, specialized and educated workforce in the region – systemic measures between schools, employers and employees“. ISA in cooperation with Slovak regions, SARIO agency and Trenkwalder organizes a roadshow with the topic focused on vocational education. SARIO agency in cooperation with ISA, Jetro and Slovak Embassy in Japan organized an investment roadshow. ISA Association attended as exhibitor the International Trade Fair for Property and Investment - Expo Real 2013 in Munich, Germany on the Octobert 7-9, 2013. PPP Association is organizing an expert discussion on Public Procurement. ISA Association is the Partner of the event. Investment Suppor Association – ISA in cooperation with the American Chamber of Commerce in Slovakia, law firm Futej & Partners, companies Graton Recruitment and Pricewaterhouse Coopers organized during May and June 2013 Business Seminars in Košice, Nitra and Žilina on a topic – The Changes in the Law and Their Impact to the Market. On the 5th of March 2013 ISA in cooperation with AmCham organized a business breakfast in Banska Bystrica. The main aim of the event was to introduce the possibility of EU funding to companies in Banska Bystrica region. On February 27, 2013, in Beijing the first from a series of investment seminars in China took place in order to present to potential Chinese investors the investment opportunities and business environment in Slovakia. The events were prepared by the Embassy of the SR in Beijing, in cooperation with ISA association, SARIO and Slovak-Chinese Chamber of Commerce. Investment seminar was organized with help and attendance of ISA members - White & Case, KPMG and IPEC Group. On November 28, 2012 Investment Support Association – ISA in collaboration with the Swedish Chamber of Commerce in Slovakia and SARIO Agency organized in Bratislava business breakfast named "SARIO - Your partner in Slovakia." The target audience were mainly established companies from the Nordic countries and the Netherlands. The event was organised by Investment Support Associaton – ISA. Its main purpose was meeting of national and international companies established in Slovakia, ISA members and SARIO partners to discuss business environment in Slovakia. Investment Support Association also celebrated its 1st birthday. General partner of the event was ČSOB Bank. Event took its place in Lobster restaurant in Senec and was attended by the State Secretary of the Ministry of the Economy of SR, Mr. Pavol Pavlis. Investment Support Association (ISA) has organized first Business Breakfast on „Investment Environment in Slovakia“. The key speakers of the first Business Breakfast were the Minister of Economy Juraj Miskov and CEO SARIO Robert Simoncic. The ISA Breakfast was attended by established companies from Bratislava and Trnava region. 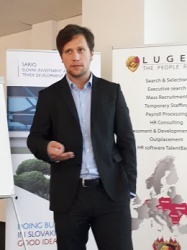 On Tuesday, 15th of November, the Slovak investment and trade development agency (SARIO) organized a seminar about the latest legislative and business updates influencing the business environment. The event was first from the series, this time taking place in Nitra for established investors of this region. The Slovak investment and Trade Development Agency (SARIO) represented our country in the Czech Republic today. In cooperation with the Investment Support Association the agency organized an investment seminar at the International Engineering Fair in Brno. The conference was attended by Minister of economy of the Slovak Republic Juraj Miskov, SARIO CEO Robert Simoncic, Deputy CEO and Director of the Foreign Direct Investment Section Andrea Gulova and ISA Executive Committee member Michal Kviecinsky.